What is a Cardiac Event Monitoring Study? If you are a patient that has visited a cardiology clinic, then you have most likely had an EKG study of the heart. As we know, the EKG is known as an Electrocardiogram study used to capture the electrical & mechanical activity of the heart. A resting EKG study captures a short snap shot of your hearts activity lasting up to 30 seconds. Much like this resting EKG study, a Cardiac Event Monitoring study uses the same technology but over a longer period of time lasting up to 30 days. 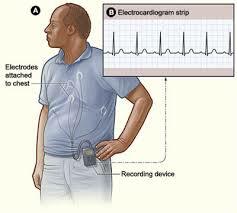 Many patients that are asked to wear a Cardiac Event Monitor have already had the standard resting EKG and / or a 24 hour Holter Monitor. 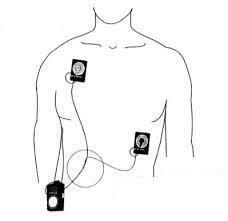 The Cardiac Event Monitor is generally used when you are experiencing symptoms of heart that cannot be captured during a real time EKG or a 24 hour Holter Monitor. The Cardiac Event Monitor is a small ‘pager’ sized device that you keep with you while you conduct normal day activities. If you experience and symptoms or abnormality in the your heart rhythm, you are instructed to press the ‘Event Button’ to tell the wearable device that you are experiencing a symptom. This process enables the device to record the ECG information so it can be transmitted to a call center monitored by certified cardiovascular specialists. That information is then organized in a report format that is sent to your physician to review your hearts activity. The Event Monitor is generally worn for a week in duration but sometimes up to 30 days. For more information, please visit our overview of Event Monitoring. Download your Free Patient Guide to Ambulatory Cardiac Monitoring.